Hundreds of years ago, the gods gave mankind a weapon called the Kira no Ken. When the gods demanded it back and mankind refused to relinquish it, the gods cursed the weapon and all who would use it. To keep it safe, the Foot Clan hid it away for centuries. The present. Karai uses the Kira no Ken to subjugate Ocho, promising to help her return to her true form so long as she serves loyally. Ocho accepts the terms and digs Karai, Koya and Bludgeon out of the cave. Upon surfacing, Bludgeon notices that Koya has taken one of the talismans from the cave, but before the matter can be pressed, he smells blood. The four find all of Toru's men slaughtered by Toshiro and Natsu. Natsu tries to make peace with Karai and Karai is willing, but only after she shoots Natsu in the shoulder to even the score. Karai then tells Natsu that she will be getting vengeance on Toru for his ruse and Natsu agrees to help. With Natsu's aid, Karai infiltrates Toru's tower. The mutants deal with all the mob goons, while Karai chases Toru. He seals himself inside a panic room and taunts her, assuring her that nothing could get in after him. Karai uses the Kira no Ken to cut through the reinforced metal door. She tells Toru that she will be seizing all his assets, including his place in Tokyo's criminal underworld. Toru warns her that using the Kira no Ken will come at the cost of her soul, but Karai just cuts his head off. A few weeks later, Karai calls a meeting of all the heads of Tokyo's crime families. She tells them that she will be running things from now on, and when they pull out their guns, she sics her mutants on them. When the killing is done, Karai tells Toshiro and Natsu that once she is done conquering Tokyo, she will return to New York. Koya struggles with the power of the talisman and considers giving up, falling to her death. However, when the bird spirit within the talisman mocks her as being weak, Koya fights back and slays the spirit, gaining control over the talisman's power. Now equipped with spectral wings, Koya swoops down and breaks up the fight between Bludgeon and Ocho. She thanks Ocho for helping her find the will to fight the spirit of the talisman and gain control. Koya then declares that she's ready for vengeance. *This story is continued from TMNT Universe #14. 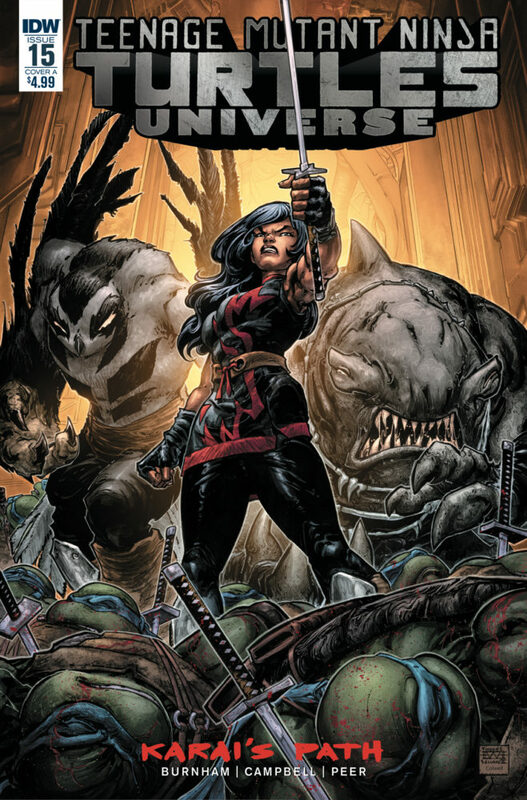 A new storyline begins in TMNT Universe #16. *The Kira no Ken can be translated as "The Sword of Hate". *This issue was originally published with 3 variant covers: Cover A by Freddie Williams II, Cover B by Sophie Campbell, and Cover RI by Kaori Matsuo. "Karai's Path" ended in a way I think we all sort of expected it to, but not in a way that disappoints (too much). 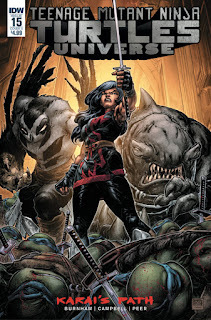 Karai has her groove back and rekindled her motivation to, presumably, inconvenience the Ninja Turtles. By the looks of things, she's going to be building her own personal criminal empire from the ground up and we can look forward to her bringing that force back into the main series sometime within the next ten years (some of these villain factions move slowly). If anything, we may end up getting a battle between Karai's faction and Splinter's Foot Clan, and that ought to be something to look forward to. There is a bit of an out in the narrative that removes much of the agency from Karai's character. When she parted ways with the TMNT, it was on a hopeful sort of note; maybe she wouldn't be a thorn in their side anymore. But now she's being mind-controlled by the Kira no Ken, so any evildoing she commits in future stories can be easily brushed aside as "not her fault, it was the sword". 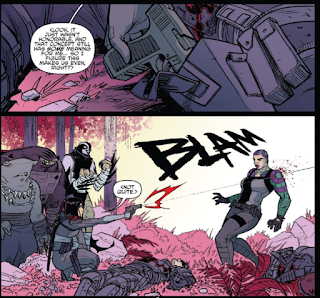 IDW's Ninja Turtles series does seem to have a problem with giving female villains authority over their actions; far too frequently, there's an escape clause that leaves the door open for them to weasel out of accountability. Sort of like how Alopex was introduced as a killing machine that genuinely enjoyed torturing her victims. But then it was revealed that Kitsune was mind-controlling her all along; Alopex's real personality, as evidenced in the issues after she was freed from Kitsune, seems to be that of a sweet-natured, giggling ditz. 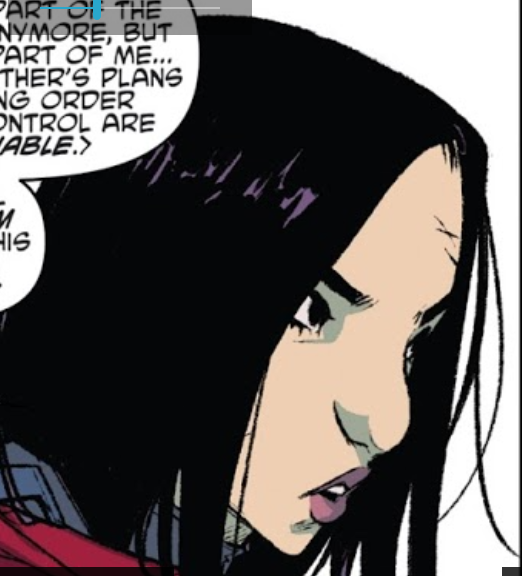 Or on a less spiritual level, there's Jennika, who again was introduced as a cold-blooded murderer for several issues. But then we got her origin story, which was an uninspired pity party about how tough her life was so it really isn't HER fault that she kills people. She's the REAL victim! I dunno, it's a trend that's always bugged me in fiction. No one thinks twice about making male villains accountable for their cruel actions without any sort of convenient mind-control bypass or sob story background to relieve them of responsibility. Female villains, however, seem to constantly get that "it wasn't her fault" Get Out of Accountability Free card. I guess because writers want to leave the option open for female villains to become love interests for the male protagonists. It's a shame, but if you give Karai agency over her horrible choices then you can't ship her with Leonardo later on. Anyway, that tangent aside, this arc did do a lot of character building work for the formerly less interesting Foot Mutants. We've got a bead on Bludgeon's personality, now, and Koya has come out of all this as a far more interesting foe. 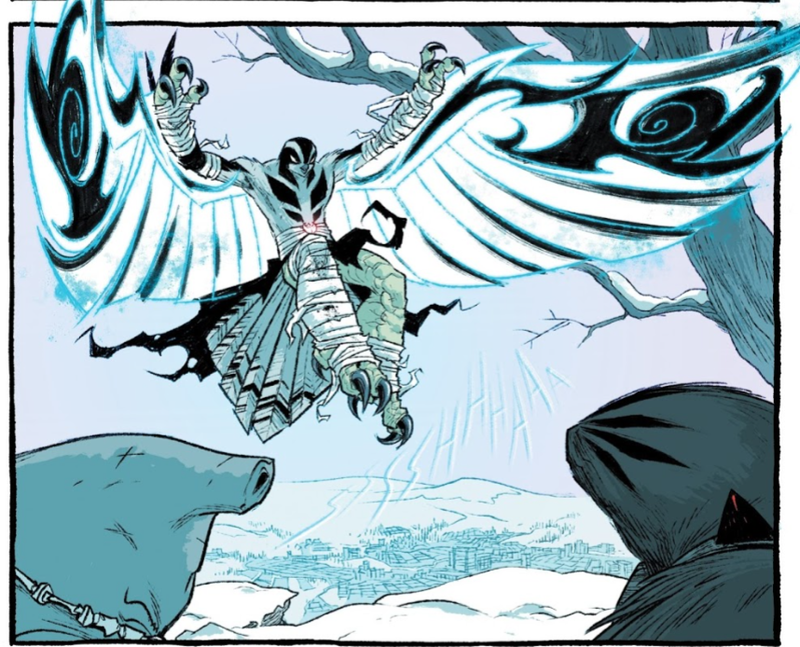 Restoring her flight almost seemed like a copout, since much of her arc has been about coming to terms with her handicap, but the visual of the spectral wings almost makes up for it. 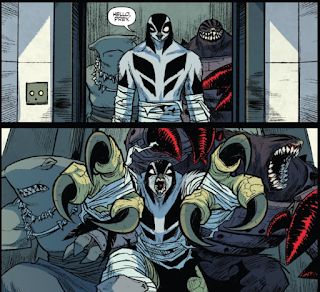 Ocho is kind of starting from ground zero as a character and I do hope they characterize her as more than a snarling monster that yells "KILL!" I guess we'll have to wait and see. Natsu also joins Karai's party to give it some extra zing. Her devotion to honor is a little hokey, and now that I ruminate on it a bit more, seems counterintuitive to her introduction in part 1 of this storyline. She opened fire on a target in a crowd of people and nearly gunned down an innocent bystander (who happened to be Karai). Doesn't seem particularly honorable behavior to me. Natsu's infatuation with "honor" seems more like something that came out of the blue as a convenience to the plot, not something that organically grew from the personality we'd witnessed beforehand. I don't know where that design choice came from, but I hope it isn't a keeper. Overall, I think I'm being a little hard on "Karai's Path", but I do think it stumbled in the home stretch. There are some great elements introduced in this storyline, along with solid character development and excellent artwork (save for Karai's face), but the cheats in the writing are also rather obvious. 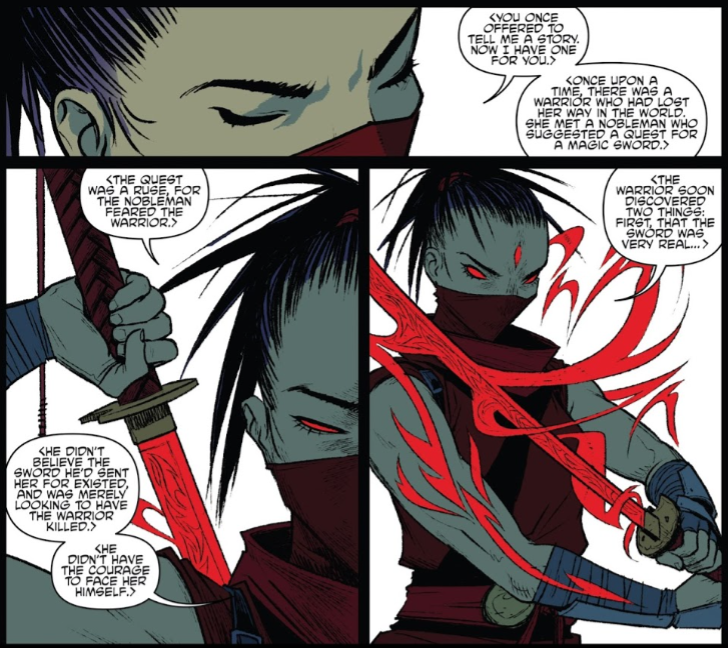 You've got a character who shoots bystanders suddenly become obsessed with honor when it proves convenient to the plot, and you've got that old IDW standby of "mystic mind-control" that will no doubt come in handy down the line when Karai needs to be absolved of all guilt for her evildoing. I think it's a case where you notice the shortcomings more easily when everything else is so solid. Now I wanna watch the Hobbit. I wanna rewatch the Hobbit now. Thinking back on Secret History of the Foot Clan (which this feels like a sequel to), Kitsune said at the end of the miniseries that his children were hers as well. This would make Karai her (several greats, as I assume to be the true extent of their familial relationship) granddaughter. 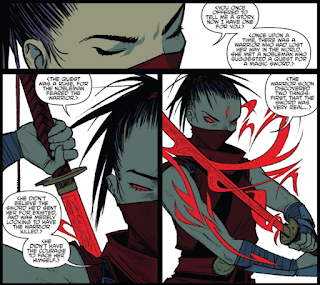 Further, since her new sword is connected to Chi-Yu and Shredder's past life. I can't help thinking that she is now under the direct influence of one of her great aunts or uncles. You're kinda incorrect about Alopex having a "was controlled all along" clause. Kitsune was only woken up a short time before Alopex left the Foot Clan, so most of Alopex's bad stuff was her own. Yes, she got mind-whammied, but only for a short time before turning on Shredder. I'll just leave general character observations about the whole arc here, as I don't have much to say on the individual issues themselves as Mark and others covered all that extremely well. -I'm going to pretend that Ocho is the closest we'll get to IDW Dirtbag until proven otherwise. 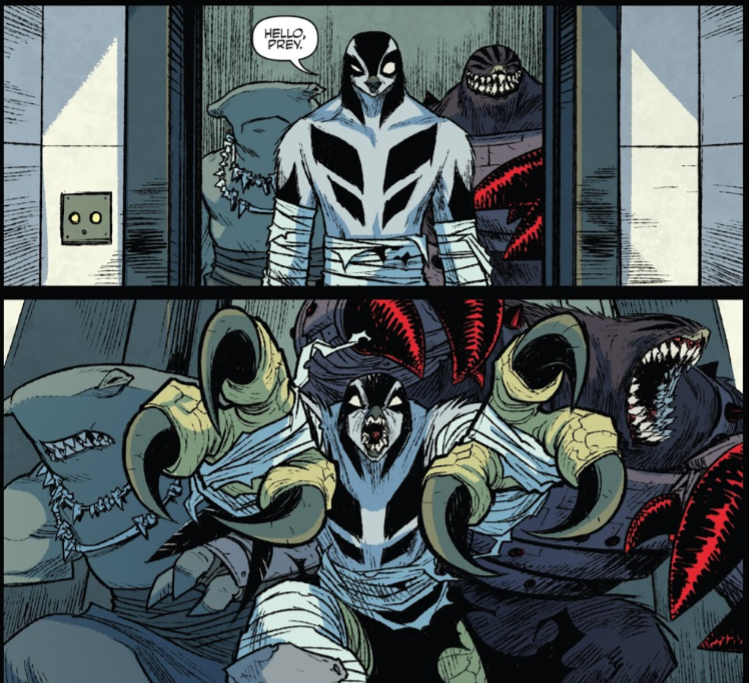 The Foot Clan in this continuity has to get a mole mutant from somewhere, right? -It took me some time at first, but I'm now really liking Natsu. 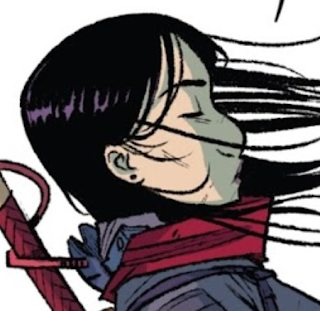 While I fully agree that her concern for honor was misplaced or done out of plot convenience, we can hopefully chalk that off to working out the kinks of introducing a brand-new character. After all the back-and-forth with Alopex in the past several years, we should be used to this by now. Also, this isn't a criticism, per se, as I don't have any problems with Natsu's dialogue, but since Natsu was originally meant to be Tatsu, Burnham, Campbell or whomever could have at least adapted Movie Canon Tatsu's terse talking/minimalist speech traits for her, to shore up the connection. That could very well enhance Natsu's incredible visual design in a "show, not tell" kind of way, but I'm happy with what we got, too. 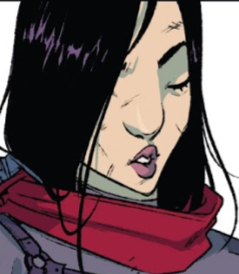 -I don't much care for Karai being mind controlled, either, especially in light of Mark pointing out the double standard about agency. 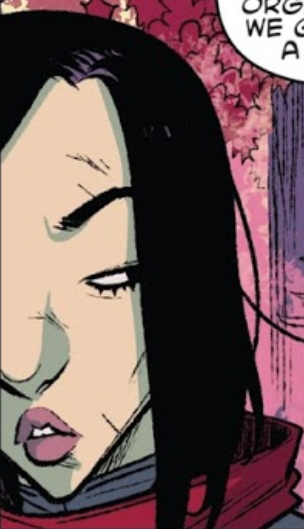 However, I'll gladly take an in-universe artificial inducement on her potentially evil behavior vs. the too-nebulous-for-its-own-good sketchy approach Laird and his writers used for her Mirage Vol. 4 counterpart. 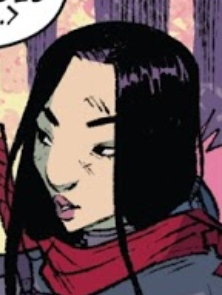 Lastly, indeed about Karai's nose. What the hell is that? 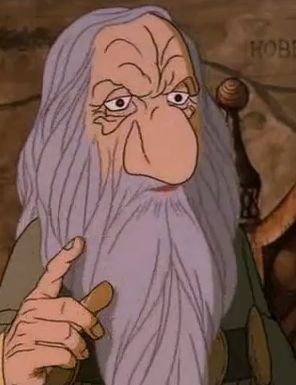 Although, I now kinda want to go check Campbell's past works to see if the "Thorin's schnoz" has appeared elsewhere. About the whole female agency issue. It's so men can fantasize about rescuing a girl from bad circumstances. Changing them from an avenging bloodthirster to a sweet angel. Basically it is the male version of "I can change him". No matter what, the man has more control and can go "I forgive you for the terrible things you've done". Pretty much as stupid as girls loving a "bad boy".